As summer slowly draws down, those leisurely days of waking to the sounds of chirping birds have instead been replaced by the sharp buzzing of the alarm clock. I'm already seeing the length of the days shrink, a slight crispness in the evening air, and the end of Twenty/20's Summer BBQ Series fast approaching. Grilling with The Chef... what could be better? Chef Steven Patrick of Twenty/20 Grill and Wine Bar brought an instructional grilling series this summer on Wednesday evenings to the Sheraton Carlsbad Resort and Spa. Set near the back of the grounds on a nice grassy area near the shimmering pool, my foodie friend Claudine and I caught the Santa Maria Grilling event featuring Grilled Artichokes with a most memorable Roasted Hummus Aioli, Grilled Peppers and Charred Oranges Dressed with Fresh Mozzarella and Local Press Olive Oil along with a flavorful Achiote Chicken. Arriving a tad late to the popular event, Claudine and I unexpectedly met 3 additional couples from our neighborhood and joined them in the included glass of wine as we watched the Chef and his helper put the final touches on the prep for the grill. With the seats packed, I was impressed at the many audience members carrying notebooks and cameras at the ready with eager faces observing the prepped ingredients. 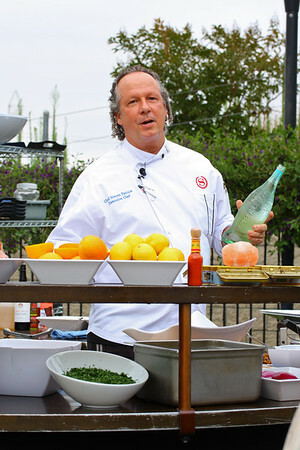 Chef Patrick took the stage and our attention was drawn to oranges and lemons put directly onto the grill. Clear, concise instructions and tips from the chef had me mentally taking notes and earnestly planning menus of my own. 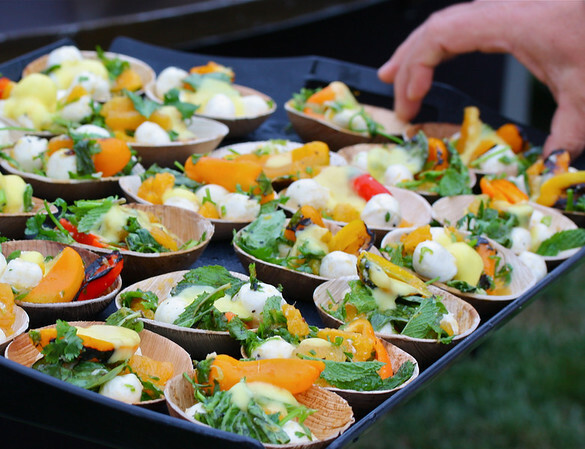 Tossing together a salad filled with the charred citrus, fresh, local herbs, a few splashes of this and a few splashes of that, he had portions served up for us on small reusable wooden bowls and the guests had a taste of a salad teeming with bright flavors and textures. Moving on to my personal favorite part of the evening, the chef continued the preparation of the mounds of cleaned and pre-steamed artichokes. Finishing them off with a quick grill and a mop of flavors, he then filled each artichoke half with a most delicious Garlic Hummus. The dip into the hummus along with the grilled and marinated flavors of the artichoke had me cleaning my plate and left me craving even more. The hummus, with its roasted garlic and charred onion, mixed delightfully with the blended ceci beans and traditional tahini as the aioli enjoyed an additional squeeze of charred lemon. My mouth still waters thinking back to my first taste. 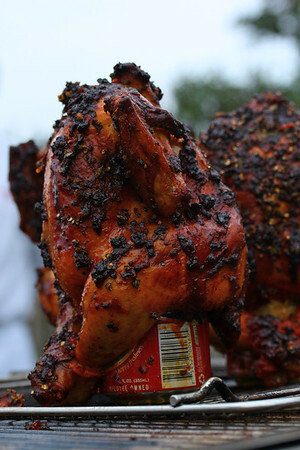 Achiote was the main ingredient for the brined and grilled chicken. Heady aromas filled our seating area as the Chef placed the prepared chickens on the grill providing grilling tips along the way and then serving them up for us all to taste. With flavors of garlic, onion, pepper and cilantro only enhancing the marinade, I enjoyed the smiles spread across the faces of the audience devouring their servings of the tasty, tender chicken. Observing the audience throughout the evening I could see that many of the guests were repeat visitors answering questions the Chef tossed out and bringing questions of their own. The open platform allowed queries and a printed menu with ingredient lists and directions allowed us to bring the information home to try on our own. I unfortunately was only able to squeeze this one visit to the BBQ Series into my summer plans, but with prior event titles of Summer Thanksgiving (including Spice Rubbed Turkey Steaks, Grill Top Focaccia Stuffing and Maple Charred Sweet Potatoes), Texas Barbeque (featuring Texas Scampi stuffed with Blue Crab) and San Diego Backyard Grill (how can we resist Tortilla Pizzas and Grilled Avocado Summer Crab Salad?) I will be planning my schedule accordingly next summer. Wow-- those artichokes with hummus look amazing. I have actually been wanting to try artichokes (have only eaten the hearts on salads from a jar) but have no idea how to cook them! 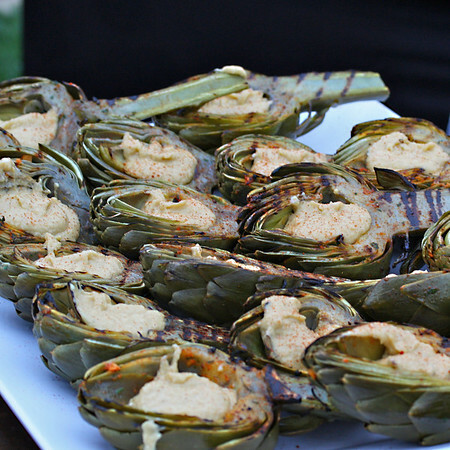 I am going to google "grilling artichokes" because those look delish and I love anything with hummus! We love grill vegetables of any kind. The grilled artichotes looks mouth watering delicious. Mini corn is also my favorite but I have not tried grilling them. Now I will. 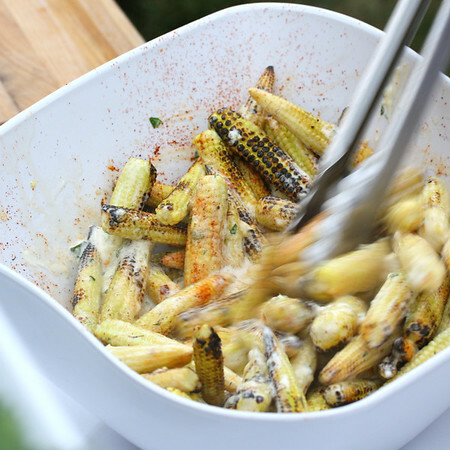 Grilled mini corn looks adorably delicious! You absolutely slayed me with those artichokes laden with the roasted hummus aioli. I love artichokes and adore hummus. I've never even thought of putting the two together though. I won't even go into the chicken below the artichoke dish. I'm going to go not enjoy a ham sandwich. Thankyouverymuch. What a fun event! That food all looks amazing :) Makes me wish I headed to San Diego like so many others here in Phoenix this weekend. I am seriously jealous that you were able to attend such a neat event. All of the food looks breathtaking. Oh, what great new ideas for the grill. 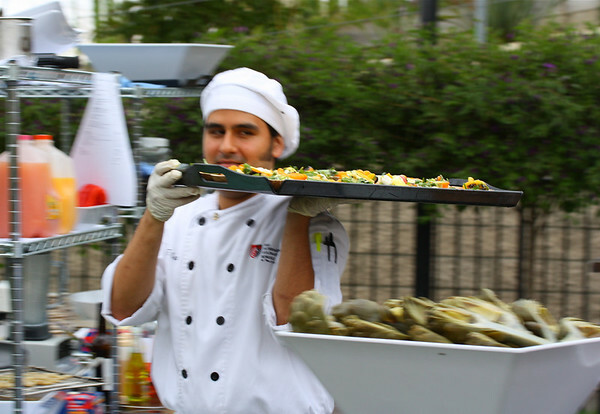 My hubby loves his charcoal grill, but he needs a reminder about indirect heat so we can try some of these beautiful dishes~ Lucky you attending this neat event! 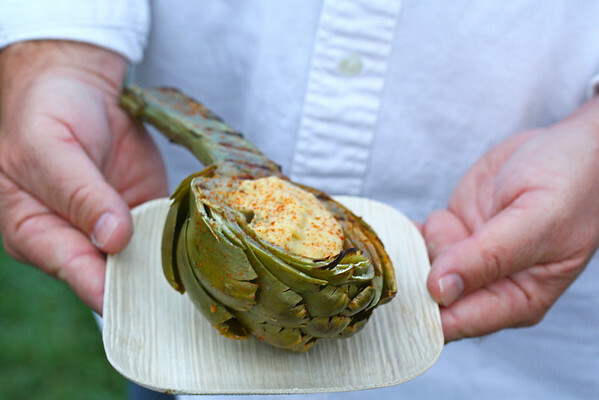 We love grilled veggies, but have never tried grilled artichokes, especially with the hummus. Sounds like a wonderful grilling demo.